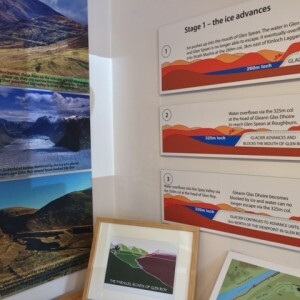 Located in Roy Bridge, at the foot of one of Lochaber’s most famous geosites and National Nature Reserves (the Parallel Roads of Glen Roy), our first Geopark Info Point is the perfect place to start any visit to Lochaber. 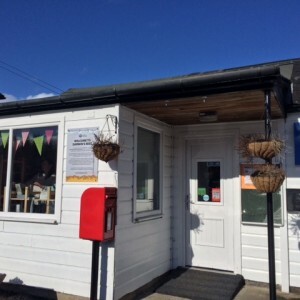 An ideal place to take the family for breakfast or lunch, with a child friendly menu, good value food and warm friendly atmosphere. There is also a sheltered outdoor seating area in the summer, perfect for those with four legged friends. Roy Bridge provides one of the best viewing spots in the area for looking into the heart of Britain’s tallest mountains, Ben Nevis, Carn Mor Dearg, Aonach Mor and the Grey Corries. Roy Bridge is also a great place to start many beautiful low land walks, with the River Roy providing a delightful stroll. Be sure to ask the coffee shop staff for advice about walks and things to do in the area. See Facebook for regular updates. There are many high quality traditional highland crafts made throughout Lochaber and Darwin’s Rest stocks a nice range of these. We also have an eclectic stock of books and leaflets on subjects ranging local history, autobiographies and geology including a range of our own Lochaber Geopark publications. Ideal if you’re looking for an authentic Highland gift, or just want to treat yourself to a good read! 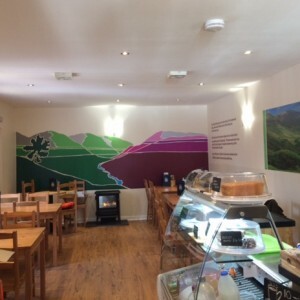 Located in the village of Roy Bridge on the A86, it’s the first stop if you’re arriving in to the Geopark from Dalwhinnie or Newtownmore off the A9. Alternatively if you’re coming from Fort William it’s a 20 minute drive via Spean Bridge. Darwin’s Rest is very close to one of our most outstanding geosites, the ‘Parallel Roads of Glen Roy’, listed as one of the ‘100 Great Geosites of the UK and Ireland’ by the Geological Society. This is also in the Glen Roy National Nature Reserve. The three horizontal ‘roads’ are the natural shorelines of a lake that was damned by a glacier. They were the subject of a dispute between Charles Darwin (who visited Glen Roy in 1838 and concluded that they were the shorelines of an ancient sea) and the Swiss geologist Louis Agassiz who in 1840 correctly suggested their glacial origin. Check out our Darwin page for the full story. There is a small display dedicated to the Parallel Roads and Darwin in the Coffee Shop with guided trips to the geosite in the high season. Keep an eye on the website and Facebook for more details.